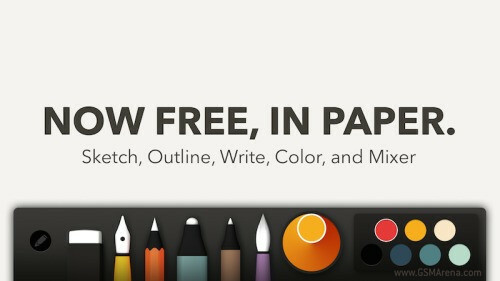 From today on these become free, which essentially means you can use the whole app for free. The decision to stop charging for the tools in the app probably means FiftyThree now expects to make enough money to stay afloat simply from sales of its Pencil stylus. This looks like a pencil, as you’d expect, but it’s quite smart too. Not content with simply being just another capacitive stylus, it has built-in Bluetooth, which it uses to communicate things such as pressure details to its iPad app. Palm recognition is in too, so when you draw or sketch using Pencil and press your hand on the touchscreen, this won’t be registered as a touch. The Pencil stylus starts at $49.95.